Shawn Shahidi’s passion is to make the old look new again. He breathes new life into vintage furniture by repainting, reconditioning and using reclaimed wood for his creative creations. The Lynnhaven resident studied interior design at the University of Maryland and has always had a knack for crafting and art design. 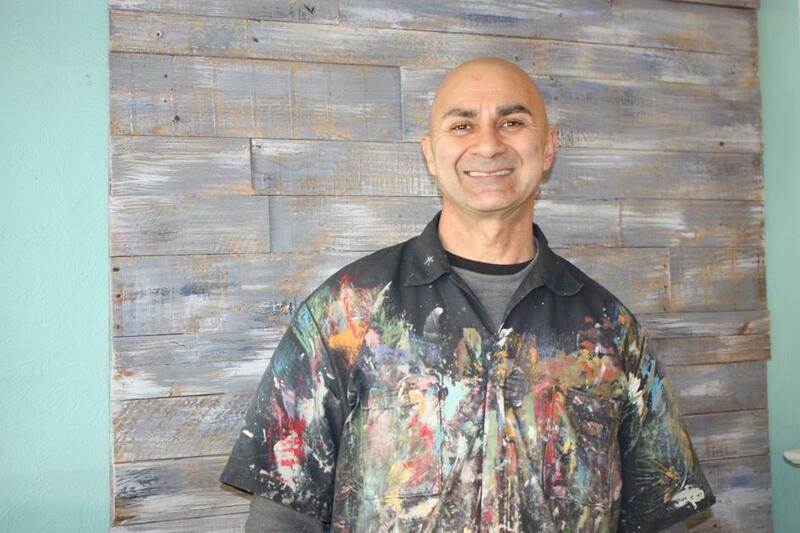 In 1986, Shahidi started selling art and decorative pieces from a push cart at a mall in Maryland and later expanded his small business to five locations. Within a year, he opened a small gallery in the suburbs of Maryland. In 2008, Shahidi was in an almost fatal motorcycle accident. When Shahidi moved to Virginia Beach in May 2016, he began crafting coastal and farmhouse style furniture from reclaimed wood and refurbished pieces out of a warehouse on South Lynnhaven Road. Most of his business was custom orders, and he also sold some of his furniture at antique malls and local gift stores. In July 2018, Shahidi opened a retail space, OL 2 NU, on Laskin Road, a few doors down from Lemon Cabana. His store specializes in custom reclaimed wood creations and coastal and farmhouse furniture such as beds, dining room tables, coffee tables and other home decor. “There are many other rustic stores in the area, but most don’t build their own merchandise,” said Shahidi. Additionally, Shahidi can refurbish flea market/thrift store finds and can recreate items that customers find online. Sandi Peters recently discovered OL 2 NU and worked with Shahidi to design a custom bed made of reclaimed wood. Peters said she was thrilled to give a local craftsman her business. What other art or crafts do you do? Some painting. Most unique furniture piece you have created? U-shaped 17 foot by 12 foot by 12 foot wooden couch made from reclaimed wood. Best-sellers in the store? Anything farmhouse, specialty coffee and dining room tables and sofa tables/wine racks. A unique custom gift item in your store? His and hers coffee mug/wine glass holder. Where do you get the reclaimed wood? Big stores, farms, other people, side of the road, etc. What’s your favorite furniture style? Rustic coastal and farmhouse. What custom pieces are most requested? Coffee tables and entertainment centers. Also, many customers request to have their old furniture refurbished and repainted. Average time for a custom piece to be created? It depends on the piece. A small wine rack takes a few hours, and a dining room table 3-4 days. Who or what in your background best prepared you for doing what you do? My interest in interior design & landscaping and always repairing and repurposing old broken pieces since I was young. If a snapshot was taken of you enjoying a perfect day, what would it look like? On the beach swimming a few blocks in the ocean, biking and exercising in the hot sun. Pet peeve: Talk and no action. Best/worst job: Best jobs: My job now, running my gallery from 2001-2016 and being a personal training and fitness manager in DC area. Worst job: Selling cars for one month after college. Something you’ve done that others might not expect of you: Riding super sport motorcycles. What is your personal motto? Trust your vibes. You won’t know unless you act on it. I think about something I like to do for about five minutes and then take a chance on it. Favorite local restaurant? Don’t know the area well yet, but my favorite local place is Aloha Snacks. They have the best burgers and fries. The most memorable words of wisdom you received and from whom: Trust your instinct and believe in yourself, my dad.